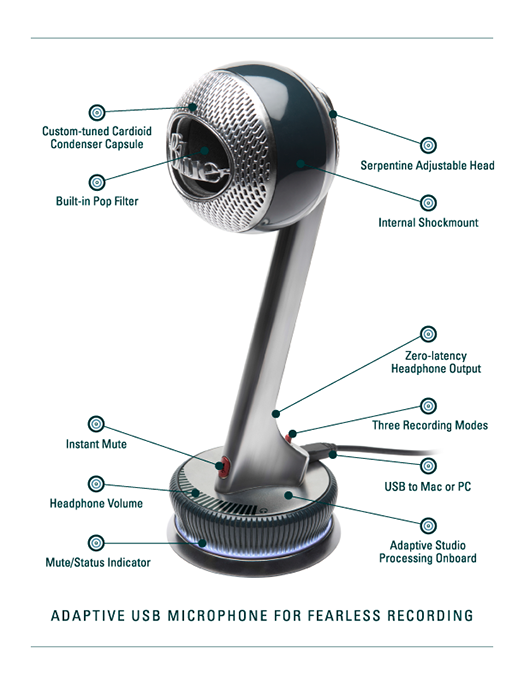 The Nessie is a unique new USB microphone from Blue. It is a small-diaphragm electret condenser with onboard DSP (digital signal processing) intended to make home recordings sound better with less effort. Voice mode: Incorporates de-essing, EQ, compression and limiting to produce a “broadcast” sound for a podcast or vocal track. The fixed EQ in this mode delivers a “big vocal with presence,” according to BLUE. The compression and limiting help compensate for uneven delivery technique. Instrument mode: Incorporates EQ, compression, limiting, and a harmonic exciter. The fixed EQ in this mode delivers a “larger frequency spectrum [with] more detailed and less forceful output” than the Vocal EQ, according to BLUE. The capsule is shockmounted to reduce handling and mechanical noise. The mic’s grille incorporates a blast/pop filter to reduce plosives when close-miking vocals. A trim ring around the mic’s base glows in blue when USB is connected. It pulses when the mic is muted (via the onboard mute button). The Nessie has a headphone jack, which provides zero-latency monitoring of the live source. A headphone volume control is also provided. The mic was initially announced during Winter NAMM, January 2013, and began shipping in June 2013.